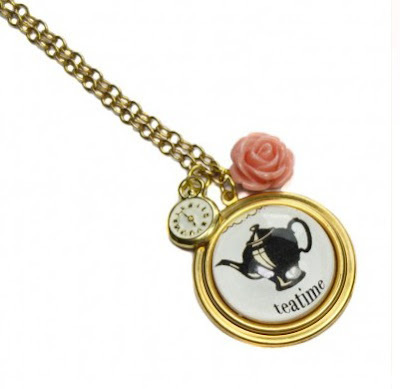 A really unusual vintage inspired necklace featuring a vintage teapot image with the words ‘tea time’ on it. I have added a little pocket watch and a coral coloured flower charm. Delightful! A wonderful, fun edition to my Alice in Wonderland jewellery range. 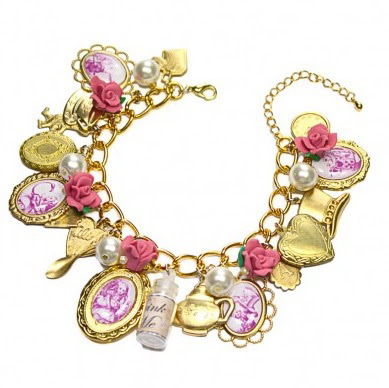 This gorgeous Alice in Wonderland charm bracelet depicts lots of magnificent elements from the Alice in Wonderland story. Attached to the gold plated chain is a teacup, teapot, top hat, drink me bottle, clock charm, White Rabbit charm, Mad Hatter charm and lots lots more! There is a rather striking contrast between the gold and the pink on this jewellery design. Certainly a must for any Alice in Wonderland collector! This bracelet is MADE TO ORDER you should allow up to a week for it to be made and then posted out. As all my items are handmade these bracelets may differ slightly from the bracelet pictured. I have many different charms and the illustrated Alice in Wonderland charms may vary in shape and design. I will make sure that each bracelet has a drink me bottle, pink roses, and glass pearls but the rest of it may be different to the picture you see so please bare this in mind when ordering. Your bracelet will still be stunning! I have made these delightful vintage inspired Parisian earrings using some gorgeous Oxidised sterling silver plated charms. 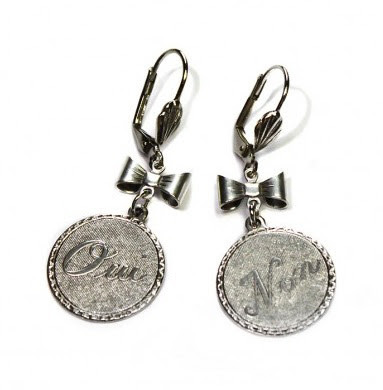 They have been attached to these rather cute antique silver bows and suspended onto silver plated ear wires. I have a pair of these for myself and I must say they are so fun and versatile to wear! As always you can find more of my vintage inspired jewellery on my website.